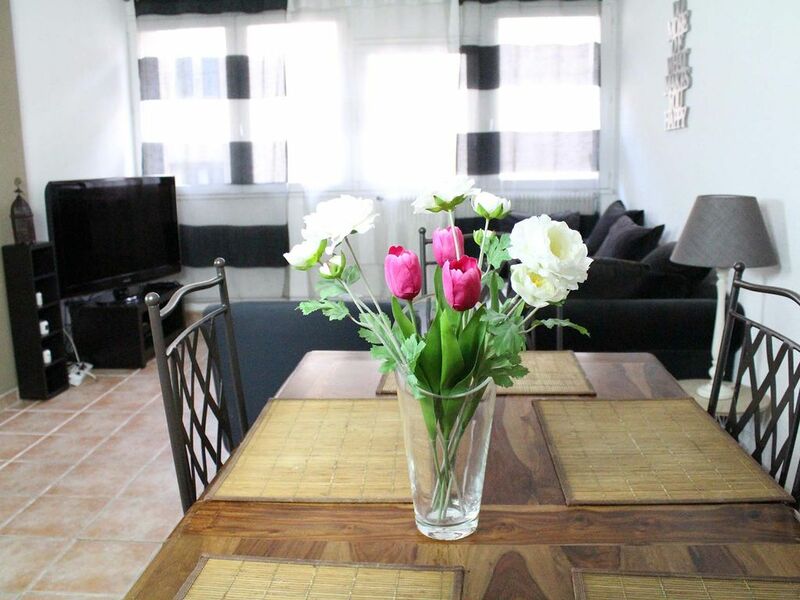 Located Quartier Balance, quiet, our duplex apartment is fully equipped and air-conditioned (air conditioning is reversible). Upstairs, there is the fully equipped kitchen (refrigerator, washing machine, dishwasher, oven, induction hob, Nespresso coffee machine and microwave) and living room and dining room consisting of a sofa 3 seats, coffee table, flat screen TV with internet access, dining table with 6 chairs. A small staircase leads to the office area with sofa bed 2 beds (130x190). You will also find 2 bedrooms: 1 with 2 single beds (190x90), the other with a bed 160x200. Finally, a nice bath room renovated in June 2014 with corner bath, double vanity, towel and toilet. All the household linen is provided: sheets, duvets, towels, tea towels. We had two great weeks at this property in Avignon. Zakahri could not have been nicer or more accommodating. He also speaks very good English. He met us at the apartment and guided us through the very tricky entry to the street so we could bring in our car. He showed us everything in the apartment and how they worked. Great wifi and great hot water. The heaters worked just fine when we needed them. We opted for the parking garage and it was a blessing, as the garage was only a few steps from the apartment and it made things so easy when we wanted to leave the city and travel. No real criticisms. The kitchen could have been better equipped and I think it could have used some painting and a really good cleaning. Maybe some nicer towels. That in my opinion would easily make this a five star property. Otherwise we loved our stay and our hosts and would highly recommend this property to anyone looking for a great location within the walls that is big and spacious. The apartment is centrally located and near all the historic sites and shopping. Zakhari recommended many cities to visit as well as restaurants and shopping. I must say he was a great host, constantly asking us is we needed anything. He was very easy to reach by phone. I would happily return to this property if we return to Avignon. I would rate this property 4.5*. Merci beaucoup. It was great!! Enjoyable and VERY CLEAN!! Very homey and very roomie!! Loved how clean it was!! Not much to critique loved how close it was to th center!! And shops!! We had a little trouble finding the call button for the apt. The temperature was great inside with an awesome option to cool off with AC after walking around. The kitchen was amazing!! We have nothing but great things to say!! The host was also an amazing communicator for directions!!!! AMAZING!! Host was awsome, very knowledgable of the area. This was well located (very close to the Place de l’Horloge, by the Château des Papes) albeit a bit hard to find the first time. But once we got in, we were very happy with it! It’s spacious and clean, with everything we needed. It’s convenient to parking - we only paid 8 €. Bedrooms look down on a pretty garden. Owners very nice and responsive. nous avons apprécié la situation proche du centre et l'espace de l'appartement où nous avons vécu à 6 facilement .